Hyper Pro Yakyuu '92 (ハイパー(超)プロ野球’９２) - Games - SMS Power! 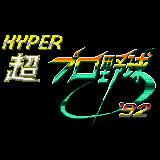 The game title has two possible readings: Hyper Pro Yakyuu '92 (ハイパープロ野球’９２) and Chou Pro Yakyuu '92 (超プロ野球’９２). The character 超 whose normal Japanese reading is "Chou" and has the meaning of "super/hyper/ultra" is explicitly given the reading "Hyper" on the box.